Russell Daya, the Executive Director of Marine and Port Operations, Port Developments and Itinerary Planning for Disney Fantasy cruise line. Representatives from major cruise lines have arrived in the British Virgin Islands to evaluate the territory’s readiness to accept their ships, and at least one cruise line said they are pleased with the progress of recovery, so far. However, local authorities are being told that there are still unsafe areas in the territory that need to be secured. 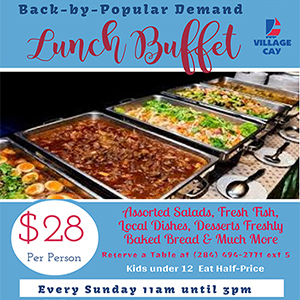 “The BVI is definitely moving in the right direction. It’s been about three-and-a-half months since I’ve been here. I see a lot of progress has been made on the roads — removal of the vegetation, the powerlines, and the cars that were damaged. There are still some boats to go but there is good progress on the boats and it’s very encouraging,” said Russell Daya, who is the Executive Director of Marine and Port Operations, Port Developments and Itinerary Planning for Disney Fantasy. 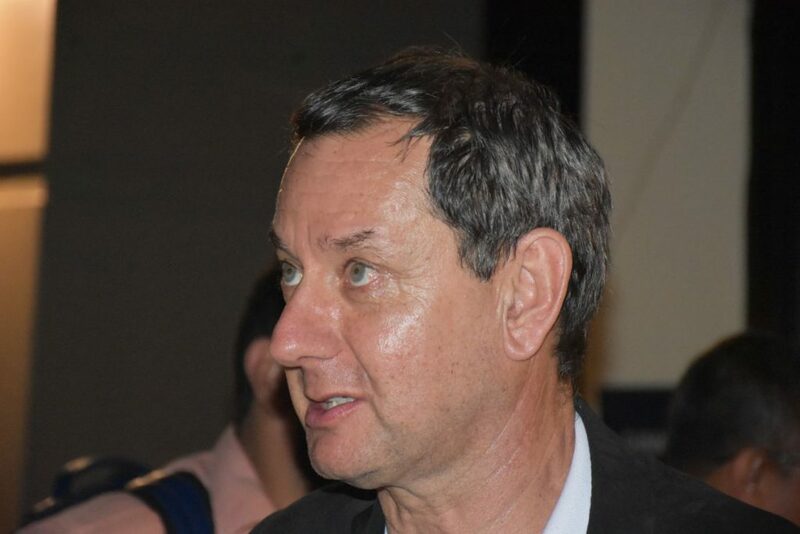 He was speaking to journalists at a media conference at The Moorings on Monday, May 14. Though encouraged by the territory’s recovery progress, the Disney cruise line representative said the territory must achieve more before his cruise company can return. “I can’t answer the question as to when we might bring the vessel back … It’s not just: ‘the roads are fixed and we come back’. We have to look at the safety and security of our guests and the families that we bring to the island and to the territory. So, that will take some further evaluation,” Daya said. In the meantime, Disney has asked local government to provide his company with weekly progress reports. He said those updates on different tourist attractions and infrastructural projects will help major cruise lines to ‘accurately and timely assess the progress that is being made’. It will also assist them to measure when they might return, Daya said. To fast-track the process, Daya made specific recommendations for one of the top tourist locations on the island of Tortola — Cane Garden Bay. “When we were in Cane Garden Bay earlier, there is still quite a lot of the structures that are being rebuilt. But when we look at the safety of them we look at them from a five-year-old’s eyes or a six-year-old’s eyes, they could easily wander into an area right under a construction site without that being screened off or shielded or adequately protected; then there is an accident waiting to happen,” he explained. “Our guests are very understanding of the devastation that took place here and they are very smart so they get it. It’s not like they don’t know the damage that’s gone on down here and the recovery is slow … But we will never rush back to a destination until we are 100 percent satisfied that the placed we would take our guests to the places they might go on their own are 100 percent safe,” he added. 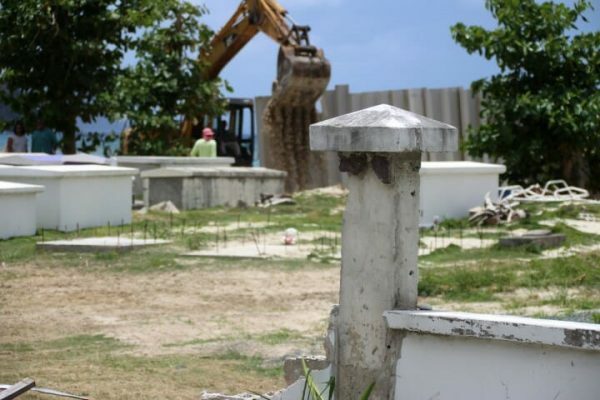 Work on the Cane Garden Bay burial ground has started. Before their cruise line representatives’ departure today (May 15), they will assess the recovery and safety of other areas such as Virgin Gorda and the Tortola Pier Park. Companies such as the Norweigan Cruise are among the other cruise lines from the Florida-Caribbean Cruise Association (FCCA) that are currently in the BVI assessing the territory’s readiness. The FCCA is a trade organisation composed of 18 member cruise lines operating nearly 200 vessels in Florida, the Caribbean, and Latin America. I wonder if he liked the Cox’s Heath fire? It’s a good job we haven’t got the RDA up and running. DIsney will be going to Haiti before BVI at this rate. What a disgraceful shambles. It is interesting that we fret about the BVI being considered unsafe for tourists. But nobody seems as concerned that it is equally unsafe for locals. Are they *ever* going to fix the missing grate in the road at the bottom of Johnson’s Ghut? That happened in the floods *before* Irma, but nobody is in any kind of rush to fix that dangerous situation. Stop sugarcoating this. We lost the entire season and wont see another big ship until October for the new season. We should be ashamed. Govt needs to make loans available to the people at no interest. Encourage people to get busy repairing, painting and landscaping their properties. We are exhausted and trying but the little insurance money can only reach so far. We are depressed living in the aftermath of Irma and Maria and so many need help. It is doubtful Disney will be back for a long time, but we are here and must strive to improve our environment. You might be fooling yourself but what you are asking for is a handout.the usual. You don’t need a massive loan to sweep up, remove piles of rubbish, clean areas filled with debris and remove it all so it looks as good as it can….but folk seem to just sit back on their arses and complain! or want to be paid for cleaning up their neighbourhood at this rate I can’t see the cruise ships ever returning as there are plenty of other areas that make much more effort and are far more friendly/welcoming – read the dreadful cruise ship passengers experiences on trip adviser…. If we’re not ready for the season now, and hurricane season is already upon us, what hopes do we have of returning to this narrative given by another cruise line — “Lush mountains, coral reefs, famous shipwrecks and impossibly beautiful beaches make the British Virgin Islands a paradise on earth. A cruise holiday to the British Virgin Islands will take you to a sun-drenched archipelago of 60 plus islands, rocks and cays. Only 16 are inhabited, but that is more than enough choice. It’s a Blessing in disguise! We don’t need to beg this cruise line to come here! Others will come, as we’ve already seen… If they were really interested in coming, they would or would’ve sent someone in to help us in our recovery in some form just as they did in the USVI or like one of the other cruise lines did. They offered help and we refused. Get the facts before talking nonsense. We are here now because as usual we think we know it all but look around at the place. I’m sorry but we have known for a long time what the cruise ships would require before they come back. Good roads, clean beaches, parking and toilet facilities, open and welcoming bars in a safe environment. So why have we ignored this simple checklist? What has government been doing? Sure, it’s complicated to clean up these bays where everything is private property but we could have and should found a way, for the sake of the nation. Clean the beaches cruisers already use – and – clean the beaches they don’t like Josiah’s Bay, sitting waiting for government attention. Smuggler’s Cove, same. Just a touch here and there and the tourism product we offered before is suddenly even better. The government and their agencies are all abject failures! The BVI deserves much better. After a Cat 5 I am not surprised we lost the first season. To me, the BVI feels like 50 to 65% of the recovery has been completed. Sure, the government was a bit slow to get some things together and sure the insurance companies held things up badly for many but there is no reason why most things can’t be ready for November when traffic normally starts to build up for the ships and other visitors. The BVI will soon be the attractive tourist destination it was before. There is a lot of opportunity for employment as the rebuild continues and finally there is new investment flowing into the hotel space now. The future is actually quite bright. Thank you for your refreshing uplifting and positive response. The minister responsible should resign immediately……. My my goes to show that all our inadequacies are being brought to the fore…..Liability is the operative word! BVI appears to be a democracy but in reality it is a quasi-socialist corrupt nation that manufactures wealth for the connected crooked families. Just look at where the opportunities for business goes too and you will all clearly see the network of white collar criminals operating above the reach of the laws of the land. No surprises there then……still a long way to go but we’ll get there eventually maybe 2021 season…. Question. Why is it that someone always have to come and tell us what needs to be done? We want to invite guests to our house and not clean it? Come on, come on. Let do what needs do be done, we are not stupid. Roads need to be fixed, water need to be on daily. The streets need to be clean and garbage removed regularly, etc. 4 weeks to tidy up the place and paint derelict buildings spending a few million dollars doing so and achieving nothing….I honestly don’t know what M is doing to improve his district of CGB as it’s clearly not enough….get somebody in that will make a difference please we need this area sorted 8 months on it still is unsafe to residents never mind dollar paying tourists…. He made it quite clear that the junkyard on the western end of CGB had got to as does the purple house. No ship coming until those sh*thouses cleaned up. one wants to see, live, eat and experience quick fixes. It took decades to build what nature took away in hours. It will take decades to get back just that much. All must be patient, hard working and committed to the over-all development of the country, beginning in each corner. Complaining and blaming will not get the progress started. You sound like someone who got money in the bank. Most of we need to fix these problems quick so we can earn a dollar again, so we can pay the damn bank. Wish we could relax like you! Is there not even one NDP representative that has shown an ounce of responsibility to clean up and sort CGB? – Its been over 8 months since Irma and it still resembles an unsafe car crash site….. We know its the main beach that cruise ships come too, which is why I avoid it when they come but its great for tourism and brings in tourist dollars! Surely its not beyond the “wit” of man to have expected somebody within the NDP to have addressed this? Are all the government ministers asleep – who has overall responsibility for this district – if its Mark V I’m surprised he’s not done more….usually he’s known for some action – not just abandon it! Everyone must understand the process required to make improvements and reconstruct following a disaster. As in the self-performed Tortola Pier Park where $45 million of the peoples money was wasted. The government must evaluate the damages and determine priorities with the resources available. Unfortunately for the BVI the Government then sees where they can personally benefit from the loss and negotiate prices for repairs. Why repair a road for cost when you can make money off of the contractor given the work. It takes time to play favorites and until officials can make money on any effort they will not make those repairs. I agree but unfortunately there will be plenty of excuses, there is not one NDP member I would consider passionate and prepared to make a positive difference…not one, its all about me,me,me….